“There are some horrible people who are pretending to be me or representing me on Facebook and charging people money to do a meet and greet on the tour (I posted a picture below of what they are doing). They are telling people that they are me or working for me and charging them $150 for a meet and greet after the play. DON’T FALL FOR THIS!! That’s not me. 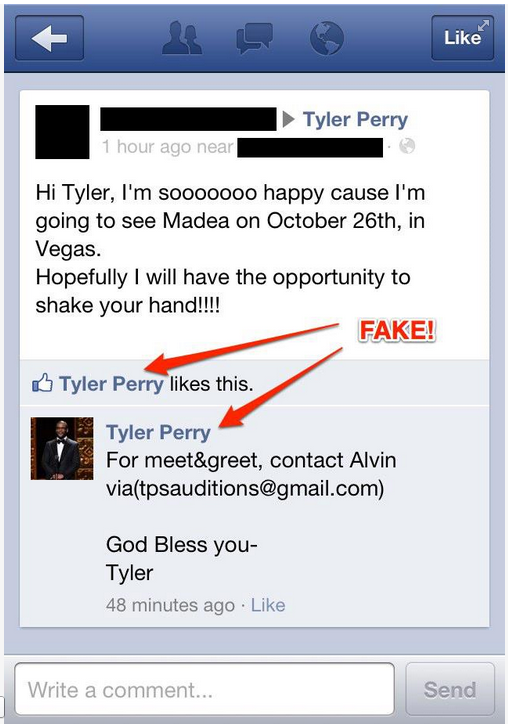 There are many fake celebrity Facebook profiles, but this is one of the only examples where the celebrity in question has lashed out at the scammers. Unfortunately, he has dinged his fans in the process. By cancelling his tour, Perry will undoubtedly be taking money out of the pockets of online scammers, but he’s also denying his fans the chance to see him. It seems like he could find a middle ground here and weed out the con artists while still running an honest tour, but Perry, apparently, doesn’t see it that way. What do you think he should have done to fight the fake Facebook profiles claiming to represent him? Was cancelling his whole tour really the best way to combat this problem?